The best buys today came from Leaseplan. 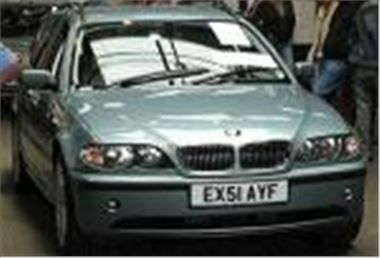 The 52k mile facelift 51 reg E46 330d SE Touring in the photo sold for a very fair £14,725. Slightly better bargains were a 55k mile 02 reg Mondeo TDCI 130 LX auto estate, sold for £6,300; a 56k mile 2000W Jaguar S-Type 3.0V6 manual, sold for £7,400; a 90k mile 2001Y Picasso HDI SX, sold for £4,100; a 103k mile 2000W Focus Zetec 1.8TD estate, sold for £2,750; a 31k mile 2001/51 Golf V5 5-dr, sold for £8,300; a 115k mile 2000W Skoda Octavia TDI 110 SLX estate, bid to £2,425; and, cheapest of the cheap, a bright red 67k mile 2000X Rover 25 1.4iL (103PS), sold for just £2,450. Other sensible buys included a 59k mile 1001Y BMW 320iSE, sold for £10,050; a 75k mile 2001Y BMW 525iSE Touring auto, sold for £10,850; a 17k mile 2001Y Nissan Terrano II 2.7TDI SE, sold for £10,900; and a 49k mile 2001Y Toyota RAV-4 VX 5-dr, sold for £12,000. Slightly less bargain-basement were a 69k mile 2001/51 Audi AllRoad 2.5TDI, sold for a high £18,000 and a 99k mile 2001Y Mercedes CLK 320 Avant Garde convertible, sold after a real bidding battle for £18,950; and a 17k mile 2001Y Mercedes V270CDI Elegance auto, bid to £16,900 provisional. Remember, van sale on Thursday, ex-fleet cars and part-exchanges on Friday, same as today at Blackbushe next Monday, and also next Monday evening a BCA Classic Sale to be held at the Brooklands Museum in Weybridge. Next Top Car at BCA Blackbushe will be Monday 14th June.